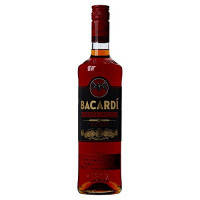 "70cl / 40.0% - A warming spiced-rum-based-spirit-drink from Bacardi, with a focus on the fiery notes of cinnamon. Bacardi Carta Fuego ages in torched oak barrels for at least a year and is charcoal filtered before bottling. It ought to spice up your cocktails and mixed drinks, that's for sure. The name, of course, comes from the Spanish word for ""fire""."